I have just decided that there is nothing that anyone can think of that cannot somehow or other be turned into a beauty treatment. I have just heard that a spa in New York is offering fish pedicures. I came across this idea some years ago when it was being proposed in the dermatology field as a cure for psoriasis. For over a hundred years it has been possible to visit a place in Turkey where a particular species of carp has been found that has a taste for dead skin. They will nibble away at the skin on psoriasis plaques, which many patients find beneficial. It is now being offered as a pedicure. The fish are used in combination with a standard foot pedicure afterwards. I don’t know how popular it is, but I imagine it isn’t for everybody. Thanks to Eric Porterfield on Flickr for the rather splendid fish pedicure picture. 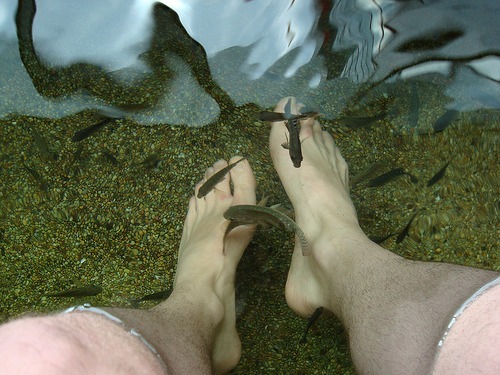 This entry was posted in Beauty News and tagged Beauty, Fish pedicure on July 24, 2008 by Colin.